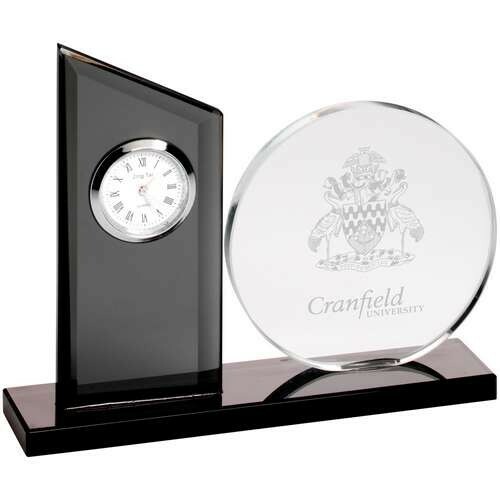 This clear and black glass clock award comes in size 13cm. We can laser engrave on the round plaque for FREE - we will send a proof of this before engraving. If you order 5 or more you will qualify for one of our special discounted prices. For more information please call or email us. Personalise Later - If you prefer you can add engraving details later on, either in your basket or in your customer login area after your order is complete. Are you having the same engraving for all of your 1 items? If all of these items are going to have the same engraving and if you want to, you can enter the text you would like engraved now. If each item will have a different engraving or if you're not sure yet what to put in there, leave it blank and after purchase, we'll send you a spreadsheet with any items that you've ordered to fill out at your leisure and send back to us.